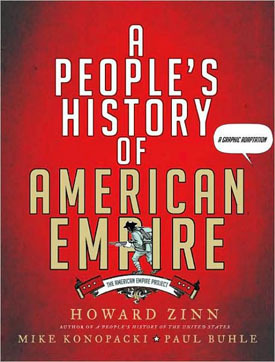 This graphic novel of Howard Zinn’s seminal A People’s History of the United States updates the information found in the original (now in its seventh edition) and features the historian as a narrator and witness to the atrocities committed in the name of American power. Incorporating recent news events, factoids, and personal details from Zinn’s memoir You Can’t be Neutral on a Moving Train (Beacon Press, 1992), A People’s History of American Empire attempts to use the comics format to fill in the blanks in the commonly accepted version of events such as the Vietnam War, the Iranian hostage crisis, and World War II. The stories provided here are essential to understanding America’s failure to live up to its promise, and its arrogant attempts to impose its will on smaller nations. 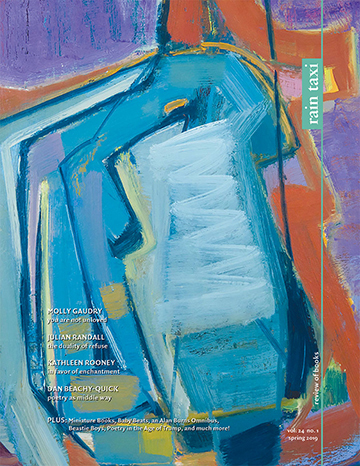 Unfortunately, Mike Konopacki’s illustrations feel tossed off when measured against other well-wrought, politically-themed graphic novels such as Art Spiegelman’s Maus or Joe Sacco’s Palestine; they render devastating tragedies in such a banal manner as to strip them of their emotional content. This is particularly disappointing when one considers the strength of the tales being told by Zinn and the dramatic photographs and newspaper facsimiles used to illustrate key points throughout the graphic novel. It is apparent that Konopacki is not the right cartoonist for the job from the very first chapter, which employs generic, goofy caricatures better suited for MAD magazine or Schoolhouse Rock than to tell the story of the 1890 massacre at Wounded Knee. The images are so unsuited to their subject matter, in fact, that they ultimately become offensive. The conquest of the Philippines and the Ludlow Massacre are depicted in a similarly bland fashion, robbing them of their inherent emotional content. The chapter in which Zinn describes his time as a soldier in WWII is one of the few sections of the book where all the elements of the graphic novel—the images, drawings, photos, dialogue, and narrative—cohere. One of his final missions as a bombardier involved dropping barrels of “sticky fire” (later known as napalm) on the small French town of Royan. This experience, which inevitably caused the deaths of civilian men, women, and children, changed Zinn forever. To be hopeful in bad times is not just foolishly romantic. It is based on the fact that human history is a history not only of cruelty but also of compassion, sacrifice, courage, kindness. If we remember those times and places, and there are so many where people have behaved magnificently, this gives us the energy to act. Hope is the energy for change. The future is an infinite succession of presents. . . and to live now as we think human beings should live, in defiance of everything around us, is a marvelous victory. The story of American imperialism seems well suited to be told through comics, a form that combines words and pictures to achieve both concision and passionate effect. Unfortunately this book, while filled with important lessons, fails to demonstrate the true power of the medium to depict our history. This entry was posted in Uncategorized and tagged summer 2008 on November 26, 2013 by admin.